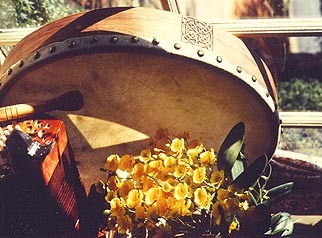 Bodhran, pronounced BO-rawn or bo-RAWN, is the name of the traditional drum played in Irish folk music. As Celtic music grows in the U.S. the instrument is becoming increasingly popular among folk musicians and is appealing to the beginner as well as to the advanced musician. Its history goes so far back that the only response to the question of its origin is that it has always been around. And that’s a sensible answer considering that the drum is probably the oldest musical instrument in world history. 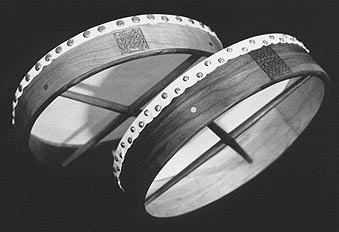 Briefly, the bodhran consists of three basic parts: the rim, the head, and the crosspieces in back. The rim is constructed of one or more layers of bent hardwood averaging 18 inched in diameter, ¼ - ½ inch in thickness and 3-4 inches in width. 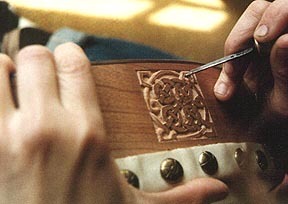 Traditionally the head is goatskin although calfskin, deerskin, and plastic are now common materials. The crosspiece is a single bar, a cross, or a "Y" anchored to the rim in the back of the drum. The player holds one hand either around or under the crosspiece and strikes the skin on the other side with a wooden beater. Sometimes bells are attached to the crosspiece. Methods of building bodhrans are as varied as their physical appearances and laced with myth and dogma. My own method is forever evolving. I will describe the method that has worked best for me with references to other approaches. My bodhrans are produced in a very small shop without a table saw or a jointer-planer and are a very good project for intermediate woodworkers.